This modern take on an older classic features a deep V-neck and armholes for a relaxed fit that can accommodate a variety of underlying layers. Perfect as a tank top cover-up, this chic vest also works well over long sleeve tops as a seasonal transition piece. 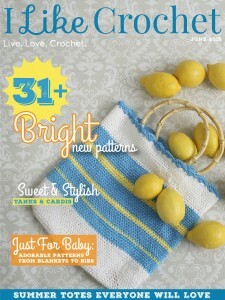 Tunisian Knit Stitch (Tks): Insert hook from front to back between the front and back vertical bars, draw up a loop. Tunisian Slip Stitch (Tsl st): Insert hook as directed, draw up loop, draw loop through stitch and loop on hook. The fan is created on the return row, where 2 chains are worked on either side of 3 stitches worked together. We count each fan as 3 sts: the fan itself is one stitch, and one chain on either side of the fan. The other 2 chains are not counted as stitches. (Keep this in mind when checking stitch counts.) Work the chains tightly for a tidy look. On forward rows, when instructed to draw up loop in these chains, insert hook in BL only. When joining yarn, secure the tail by weaving it in immediately to prevent first stitch from unraveling. Last stitch of forward row is always worked under front and back vertical bars unless otherwise instructed. The fabric will tend to curl. Wet blocking when done will eliminate the curl. Ch 138 (154, 170, 186, 202). Row 1 Fwd: Draw up back loop of each ch. Row 1 Rtn: Yo, draw through 1 loop, (yo, draw through 2 loops) 4 times, [ch 2, yo, draw through 4 loops, ch 2, (yo, draw through 2 loops) 5 times] 8 times, (yo, draw through 2 loops) 5 more times, *ch 2, yo, draw through 4 loops, ch 2, (yo, draw through 2 loops) 5 times, rep from * to end. Row 2 Fwd: Tks in next 4 sts, *sk next ch, draw up loop in next ch, insert hook in loop behind fan and drap up loop, draw up loop in next ch, sk next ch,Tks in next 5 sts, rep from * 8 times, Tks in next 5 sts, rep from *8 times, to last 4 sts, tks in next 4 sts, work last st.
Row 2 Rtn: Rep row 2. Rep row 2 till work measures 13” or desired length. Divide for Front and Back. Count 69 (77, 85, 93 101) sts from beg PM in this st. This represents the side “seam” there should be the same number of sts on other side of this M.
Row 1: Sl st over next 3 (3, 3, 3, 7 sts , draw up loop in next bar, cont in patt to last 4 Tks before M, draw up loop in next 2 bars, leave next 3 (3, 3, 3, 7) sts unworked. Row 2: Sk first ch, draw up loop in next ch, draw up loop behind fan, draw up loop in next ch, sk next ch, cont in patt to last st (this will look like 2 sts worked together), insert hook under both sts and draw up loop. Row 2 Rtn: Yo, draw through 1 loop, ch 2, yo, draw through 4 loops, ch 2, cont in patt completing last ch-2 of last fan, yo, draw through 2 loops. Row 3: Sk first ch, draw up loop in next ch, draw up loop behind fan, draw up loop in next ch, sk next ch, cont in patt to last fan, sk next ch, draw up loop in next ch, draw up loop behind fan, draw up loop in next ch, sk 2 ch, draw up last bar. Row 3 Rtn: Rep Rtn row of row 2. Rows 4–9 (4–6, 4-5, 4, 4–6): Rep row 3. Row 10 (7, 6, 5, 7) Dec row Fwd: Rep row 3. Row 11 (8, 7, 6, 8) Fwd: Draw up loop behind fan, draw up loop in next ch, cont in patt to last fan, sk next ch, draw up loop in next ch, draw up loop behind fan, draw up loop in last bar of fan. Row 11 (8, 7, 6, 8) Rtn: Yo, draw through 3 loops, ch 2, cont in estab patt to last fan, ch 2, yo, draw through 4 loops, ch 1 to close fan. Rows 12-19 (9–13, 8–11, 7–9, 9–13): Rep prev row. Row 20 (14, 12, 10, 14) Dec row Fwd: Rep fwd of row 11. Row 21 (15, 13, 11, 15): Draw up loop in next ch, sk next ch, cont in patt to last fan, sk next ch, draw up loop in next ch, draw up loop in last bar (2 sts worked together). Row 21 (15, 13, 11, 15): Rtn: Yo, draw through 2 loops, ch 2, cont in estab patt to last fan, ch 2, yo, draw through 3 loops. Rows 22–29 (16–20, 14–17, 12–14, 16–20): Rep prev row. Row 30 (21, 18, 15, 21) Dec row Fwd: Rep row 21. Row 31 (22, 19, 16, 22) Fwd: Draw up loop in next Tks, cont in patt to last st, draw up loop in last bar (2 sts worked together). Row 31 (22, 19, 16, 22) Rtn: Yo, draw through 1 loop, *yo, draw through 3 loops, cont in patt across. Rows 32–35 (23–27, 20–23, 17–19, 23–27): Tks in next 5 sts, cont in patt to last 6 sts, Tks in next 5 sts, draw up in loop last bar. Rows 32–35 (23–27, 20–23, 17–19, 23–27) Rtn: Rep rtn row 31. Row (28, 24, 20, 28) Dec row Fwd: Rep prev fwd row. Rows (29–35, 21–29, 21–24, 29–34): Work even in patt. Row (30, 25, 35) Dec row Fwd: Rep prev fwd row. Rows (31–35, 26–29, 36–41): Work even in patt. Row (36, 30, 42) Dec row Fwd: Rep prev fwd row. Row 35 Fwd: Rep prev fwd row. Rows 36–39: Work even in patt. 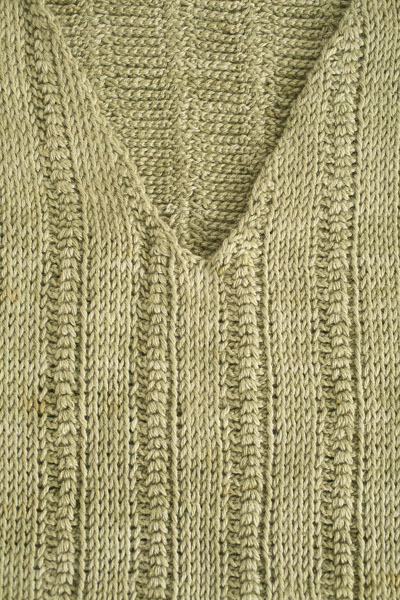 Short rows are used for shoulder shaping. Follow the instruction below, leaving any unworked loops from the first forward row on the hook until the third return row. Next Row Fwd: Draw up loop in patt in next 13 (16, 18, 20, 21) sts. Next Row Fwd: Inserting as in Tks, draw up loop in next 9 (11, 13, 14, 16) sts. Next Row Fwd: Draw up loop in next 4 (5, 6, 6, 7) sts. Tsl st across, inserting as in Tks, fasten off. Join yarn in 14th st from end of row. Next Row Fwd: Draw up loop in patt in next 3 (4, 5, 5, 6) sts. Next Row Fwd: Draw up loop in patt in next 9 (11, 13, 14, 16) sts, working into short row just made and then into prev row. Rtn: Yo, draw through 1 loop, *yo, draw through 2 loops, rep from * across. Next Row Fwd: Draw up loop in next 13 (15, 17, 19, 20) sts, inserting as in Tks working into short row just made, then first shoulder-shaping row. Tsl st across, inserting as in Tks, to fasten off. PM in side panel (group of 10 Tks) between 5th and 6th Tks. This is side of garment, opposite seam. PM in center Tks on front (M goes in 35th, 39th, 43rd, 47th, 51st) st.
Decreases at armhole edge should be done exactly as on back. Refer to instructions on Dec rows of back, following beg of fwd row and end of rtn row for all armhole decreases. At the same time, dec at neck edge as instructed below. Row 1: Join yarn in 4 (4, 4, 4, 8)th st from first M, Tks in next 2 sts, work in patt to st before M.
Row 2 Fwd: Sk next ch, draw up loop in next ch, draw up loop behind fan, draw up loop in next ch, cont in patt across, draw up loop in last bar inserting hook under 2 sts worked together. Row 2 Rtn: Yo, draw through 1 loop, ch 2, yo, draw through 4 loops, ch 2, cont in patt completing last fan, yo, draw through 2 loops. Row 3 Fwd: Work in patt to last fan, sk next ch, draw up loop in next ch, draw up loop behind fan, draw up loop in next ch, sk next ch, draw up loop in last bar. Row 4 Fwd: Work in patt to last fan, sk next ch, draw up loop in next ch, draw up loop behind fan, draw up loop in last bar of fan inserting hook under 2 loops. Row 4 Rtn: Yo, draw through 3 loops, ch 2, cont in patt across. Row 5 Fwd: Work in patt to last fan, sk next ch, draw up loop in next ch, draw up loop in last bar of fan. Row 6 Fwd: Work in patt to last fan, sk next ch ch, draw up loop in next ch, draw up loop in last bar inserting under 2 loops. Row 8 Fwd: Rep fwd row 6. Row 9 Fwd: Work in patt completing last 5 Tks, draw up loop in last bar. Row 9 Rtn: Work in patt to last st, yo, draw through 2 loops. Row 10 Fwd: Rep fwd row 9. Row 11 Fwd: Work in patt completing last 5 Tks, draw up loop in last bar inserting under 2 loops worked together. Row 11 Rtn: Yo, draw through one loop, cont in patt across. Row 12 Fwd: Work in patt across. Row 13 Fwd: Rep fwd row 12. Row 13 Rtn: Yo, draw through 1 loop, cont in patt across. Row 16: Rep row 13. Row 20: Rep fwd row 12. Row 20 Rtn: Yo, draw through 1 loop, ch 2, cont in patt across. Row 21: Work in patt across. Row 22: Work in patt to last ch 2, sk next ch, draw up loop in next ch, draw up loop in last bar inserting hook under 2 loops worked together. Row 22 Rtn: Yo, draw through 1 loop, ch 2, cont in patt across. Row 23: Work in patt to last fan, sk next ch, draw up loop in next ch, draw up loop in last bar of fan. Row 24: Work in patt to across to last st (2 sts worked together), draw up loop in last st inserting hook under 2 sts worked together. Row 25: Work in patt to last st, draw up loop in last st.
Row 26: Rep fwd row 25. Row 27: Rep row 24. Rows 28-29: Rep row 25. Row 30: Rep fwd row 28. Rows 31-35: Work even across. Row 29: Work in patt. Row 30: Work in patt across. Large and 1X only dec at armhole 20, 26 sts. Row 31: Work in patt. Row 33: Work in patt. Row 35: Work even in patt, cont to shoulder shaping. Rows 34-35: Work even in patt. Row 36: Work even in patt. Row 38: Work even in patt. Rows 40-41: Work even in patt. Follow instructions for Back Right Shoulder Shaping. Work decreases at armhole edge as on back. At the same time, decrease at neck edge as instructed. Join yarn 1 st to the left of M.
Row 1 Fwd: Draw up loop in same st, draw up loop in next st, cont in patt to last 3 sts, leave them unworked. Row 2 Fwd: Sk next ch, draw up loop in next ch, cont in patt to last st (2 sts worked together), draw up loop in last st inserting hook under both bars. Row 2 Rtn: Yo, draw through 1 loop, ch 2, yo, draw through 4 loops, ch 2, cont in patt to last st, yo, draw through 1 loop. Row 3 Fwd: Sk next ch, draw up loop in next ch, cont in patt completing last fan, sk last 2 ch, draw up loop in last bar. Row 4 Fwd: Draw up loop behind fan, draw up loop in next ch, cont in patt across. Row 4 Rtn: Yo, draw through 1 loop, ch 2, yo, draw through 4 loops, ch 2, cont in patt across to last fan ch 2, yo, draw through 4 loops. Row 5 Fwd: Sk next ch, draw up loop in next ch, cont in patt across. Row 8 Fwd: Work in patt. Row 9: Fwd: Draw up loop in next Tks, continue in patt across. Row 10 Fwd: Work in patt across. Row 11: Work in patt. Row 12: Rep fwd row 11. Row 13: Work in patt. Row 16: Rep row 11. Row 20: Work in patt. Row 20 Rtn: Work in patt completing last fan, yo, draw through 2 loops. Row 21: Work in patt. Row 22: Draw up loop behind fan, draw up loop in next ch, cont in patt across. Row 22 Rtn: Work in patt to last fan, ch 2, yo, draw through 3 loops. Row 23: Draw up loop in next ch, cont in patt. Row 24: Tks in next st, cont in patt across. Row 27: Work in patt. Rep rem rows of Front Left, up to Shoulder Shaping. Rep Back Left Shoulder Shaping. Wet block and pin sweater. To fit on blocking board, you can do half of it at a time. Sew side seam. Sew shoulder seams. Join yarn in any st at underarm and work sc edging around entire armhole, inserting hook under 1 or 2 loops as is convenient. Rep on opposite armhole. 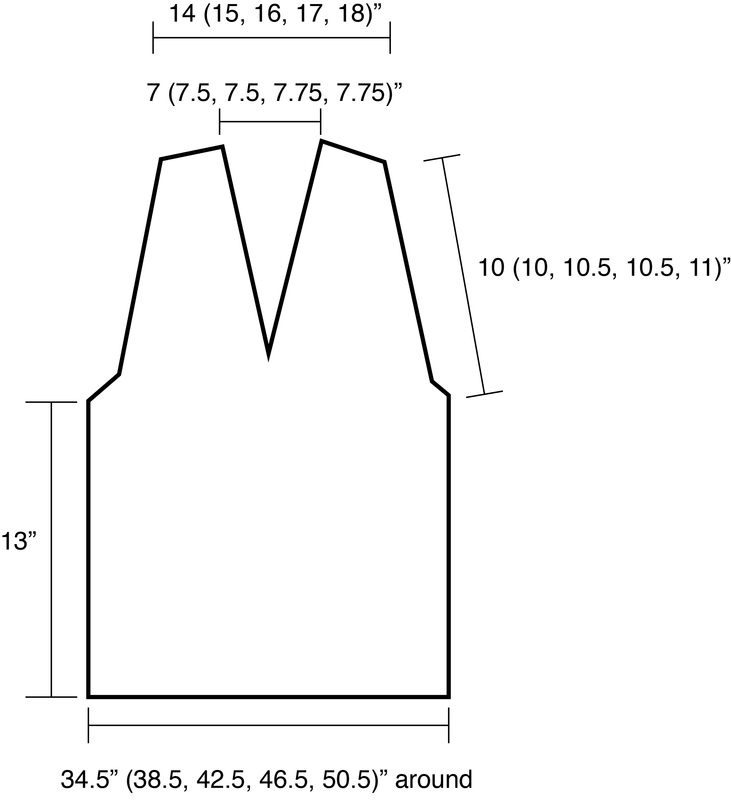 Optional: you can also add sc edging around the neckline to clean up any irregularities.